When we think of social media and business, the first few things to come to mind are Facebook and Twitter. Yet, there is one mobile app that tends to get overlooked by businesses: Foursquare. True, it doesn’t have the same numbers that the likes of Facebook and Twitter can boast, but what it does have is a dedicated audience which has made over three billion check-ins. Regardless of whether you’re a retailer or not, any business can use Foursquare and getting yourself set up is easy. The only thing it needs is you to get involved. While it has a web presence, Foursquare has been growing quite steadily over the last few years, and offers some unique opportunities for businesses and brands. With over 25 million users globally and 31% of mobile users active on social networks using Foursquare, it has an engaged community and a passionate user base. Foursquare’s main strength comes from its users, the power of personal recommendation and sharing on different social media sites. By seeing where their friends are going and the places they regularly frequent, they would be more likely to visit if the recommendation is positive. Foursquare doesn’t get the same attention as Facebook or Twitter, but this presents you with a better opportunity to develop customer loyalty through deals. While Facebook has released its new ‘nearby’ function for its app, Foursquare is still the king of check-in and location. With over 40 million venues and one million businesses to check-in to, there’s a lot of potential to make Foursquare work for you. The first thing a business should do is to claim a location as your own, and inform Foursquare that you are the official owner of this particular space. By claiming this space, it will ensure that your business will appear on the map. There are two ways you can add your business onto Foursquare: The first is to visit Foursquare’s website and access its search engine. Type in the name of your business and if it appears, clicking the “Claim here” link will allow you to claim ownership. Alternatively, you can do this through the app as well, if the location doesn’t have an owner, or you can ring or mail Foursquare to verify your location. 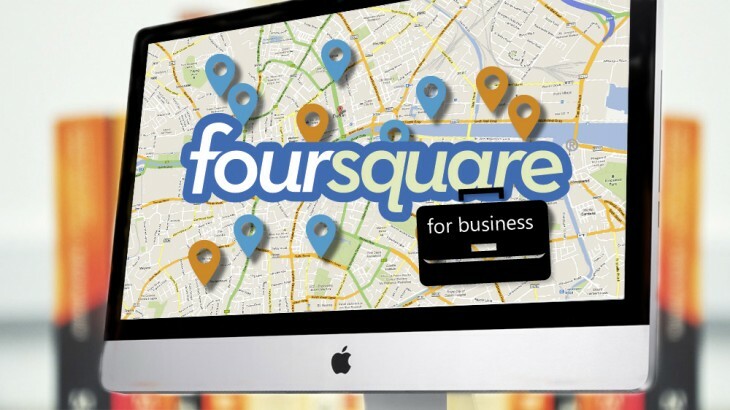 If you can’t find your business on Foursquare search, you will need to add it manually. After signing in, head to the “Add venue” section. Here you will be able to add the name, address, location, contact details and category your business falls under. It’s recommended that you provide as much information as possible so that people can easily find it when they’re in the area. Alongside a mobile presence, Foursquare also allows you to create a web presence which allows you to manage all your locations in one place. Users can choose to follow pages, which will mean their updates will appear in the “Friends” section. This is handier for those businesses with multiple locations who want to inform users of deals in multiple locations. Each web page allows for a banner, sized 860 x 130, to be placed at the top of your page. Alongside your profile photo, you can place links to your website and other social media profiles underneath your description. As well as showing all the different places your business is located, a page administrator can leave tips at your locations and other places too. This gives you the ability to leave messages for your followers informing them of check-in specials, deals, coupons and announcements relating to your business. These updates can be filtered so that they are only shared with specific locations or with the entirety of your company. This allows you to create local updates, and make them more relevant to specific followers. All updates can have images added onto them (which is encouraged) as well as be cross posted to Facebook and Twitter to ensure maximum exposure. These updates will appear on each follower’s news feed, but can only be accessed through desktop. As of yet, there is no way to post updates via the app. One thing to note its that not all Foursquare pages have physical locations, meaning products or people can communicate with followers without claiming a place. One of the main pulls of Foursquare is the offering of deals and specials, giving users a reason to visit your business and can help you get new customers and followers. The type of offer you want to make available depends on the type of company you run, but the most popular ones would be offering the mayor of your location a discount, rewarding people for their first check-in, an offer when you check-in with friends, and an offer if you check-in to the same location numerous times. You can offer more than one special at a time, which allows you to reward both new and regular customers. Different specials work for different businesses so you should test out different specials and see what works for your business. If you’re unsure, it’s worth testing out two different offers against each other to see which one gets the most ROI. Through this and promotion via local updates and other social media channels, you can get the word out there. Another factor that contributes to Foursquare’s success is the inclusion of tips for a specific locale. Tips allow users to find out more about a location, whether they recommend it and what other useful information they should keep in mind when they’re there. With 30 million insider tips available on the app, it’s a feature that users have taken to heart. Tips aren’t just limited to just users, businesses can write up their own versions to ensure that users know everything they have to offer as well as give the company some personality. What you should aim for is to become an authority on your area by providing tips about other locations close by. If you’re a cafe, you could recommend the park nearby as a great place to enjoy your latte. If you’re a sporting venue, you can inform followers where the dedicate fans like to visit first before they go to a game. Think about what your company has to offer and tie it into the places around you. Doing this will make your business more accessible to new and regular customers and hopefully allow other businesses to leave tips about you too. When you have a collection of tips, the next step you should take is to turn them into curated lists for your fans to follow and contribute to. Lists are usually focused on specific locations or topics and can be very useful when you’re trying to build awareness of your business. A popular list will give it more exposure without requiring users to follow you so look at tips from other businesses and start putting together different lists. Usually, it’s best to focus on your area, especially if you’re based in a large city, but there’s nothing to say that you can’t create a citywide list which would come in handy for tourists and visitors. One of the most popular features of Foursquare is the ability to earn badges when they check-in at various locations. Foursquare incorporates its own built-in badges such as the adventurer badge and the mayor badge, but businesses and brands can also apply to have their own custom badges included. However, demand is very high for custom badges, and Foursquare is very selective in the kind of badges it approves. Also, Foursquare’s minimum badge commitment is three months at $25,000 per month, making it a costly venture. Once you’ve got your idea and plan in place for your custom badge, the next step is pitching the idea to Foursquare. All applications must be submitted through Foursquare’s business page, where you will be asked to complete on online form. To submit a custom badge application to Foursquare, go to the Foursquare Partner Badge Inquiry page and select “Partner Badge” under “badge type.” Enter your first and last name in the appropriate box, then enter your business email address underneath. Outline your idea for the badge campaign in the space provided. To get the attention of the approval team, your idea must be solid, easy to communicate, and in line with the key elements Foursquare is looking for in a custom badge. This article is published in association with SimplyZesty, a digital marketing agency.